The centrepiece of Turnbull’s budget is handouts to business and high income earners. But for workers and the poor there are only cuts. The Liberals still want to force through the bulk of the $80 billion in cuts to health and education and the cuts to Family Tax from Abbott’s horror 2014 budget. Cuts to Family Tax payments will see a couple on one average income with two children in high school lose $2800 a year, while a single mother on $65,000 with two children will be $5000 worse off. Single parent families in the poorest 20 per cent of the population will be worst affected by the budget overall, according to modelling done at ANU, losing $1400 a year. Low income couples with children are not far behind. The cuts to Medicare pathology services, including blood tests, x-rays and pap smears, have also been retained. The Medicare rebate has been frozen again, meaning more doctors will stop bulk-billing and charge co-payments. According to a Sydney University analysis, GPs will lose $9700 in income next year, and $29,500 the year after. Primary Health Care, which owns 54 bulk-billing GP clinics across the country, announced two days after the budget that it will begin charging patients up front in a number of locations. Aged care has also taken a $1.2 billion cut. Treasurer Scott Morrison says this spending is “unsustainable”. But his priorities are clear. All up the government is handing back $13.3 billion in tax cuts over four years. This is more than three times what the government is prepared to put back into schools and hospitals. Everyone earning over $80,000 a year, including those on million dollar incomes, will get a tax cut. Only the top 25 per cent of tax-payers will benefit. The tax increase on those earning over $180,000, introduced two years ago as a “deficit repair levy”, is also being reversed. As a result someone on a million-dollar income gets a $16,700 tax cut. Alongside that are tax cuts for business. The Liberals are trying to cover themselves by saying these will go to small business first. But they are also sneaking in a hefty tax cut for big business over the coming years, as the tax cuts are extended to larger and larger companies over time. Over ten years big business will get a sizeable tax cut from the current 30 per cent to 25 per cent—at the cost of an enormous $48 billion. The Liberals want us to believe that handing back money to business will see it trickle down to workers. That is the substance of the government’s grand plan for the economy. But many of them will just pocket the money and run. The government is raising more money through cutting back on superannuation concessions for the rich and corporate tax evasion. But the outcome is modest—more for show in the lead up to the election than any serious attempt to tax the rich. The superannuation changes will claw back $2.9 billion over four years from high income earners. But there are $12 billion every year in concessions going to the top 10 per cent of income earners alone. The same is true of corporate tax evasion. Apparently the best the government can do is raise an extra $1 billion a year. Yet the tax office’s own Corporate Tax Transparency Report released late last year told us more than one in three big companies were not paying any tax at all! 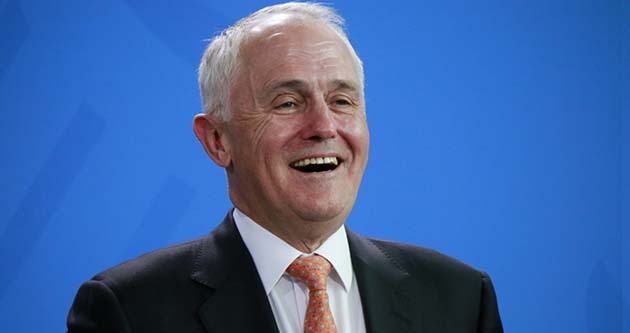 Turnbull has restored just over 25 per cent of the money Abbott cut from schools and a third of what he cut from hospitals between now and 2020. This is less a funding increase than an election fig-leaf. The bulk of Abbott’s $80 billion in cuts will stay. The schools funding increases recommended by the Gonski review weren’t simply a wish list. They were designed to address concentrated disadvantage and inequality in the school system. But the Liberals have no interest in properly funding schools in poor and disadvantaged areas—as Turnbull showed when he speculated that it might be better for the federal government to get out of funding government schools altogether, and just go back to looking after private schools. But as usual there’s plenty of money for war. Australian participation in the wars in Iraq and Afghanistan get an extra $666 million. The total boost for defence is just short of $1 billion, taking its budget to a whopping $32.3 billion next year. There was little for the environment, with the budget confirming a $1.3 billion cut to the Australian Renewable Energy Agency (ARENA), which helps fund research and development of renewable energy technologies. And there are many other smaller, nasty cuts like $115 million from homelessness services and $40 million from community legal centres that will also cost jobs in the community sector. After Turnbull’s pathetic effort, the need to seriously tax the rich to fund schools and hospitals is clearer than ever. This budget should brand Turnbull as the champion of big business and the rich—and help make sure he’s booted out at the election.